Hi! 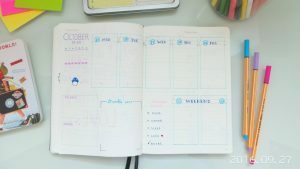 Recently I posted a video on YouTube to show you my full bullet journal setup for October. It is meant to be an accompanying video for the post that I’m about to make below. I have been bullet journaling for a few months, but haven’t really dedicated a lot of time to designing it in a way that adjusted to my tasks and goals. 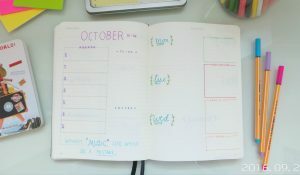 But I started feeling more ‘creatively inspired’ in September, and spent more time designing and structuring my spreads. I’m not very artistically talented… at all.. so it took me quite a long time to design my pages. 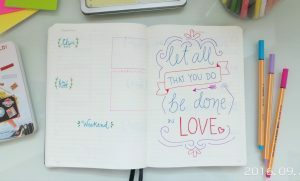 Note: Most of my weekly spreads are inspired by those I’ve seen on Pinterest and Tumblr. It was definitely a very relaxing thing to do every night – designing, drafting, drawing – but after this month, I don’t think I’ll be spending as much time on this task. 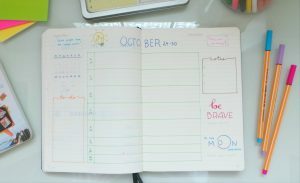 I probably spent more time designing my bullet journal than actually doing stuff – and that’s not good. The main materials that I used to bullet journal are my Leuchtturm 1917 Medium Hardcover Notebook Black and my Stabilo Point 88 pens. Let’s now proceed to my bullet journal! 1. The first page is, obviously, the Title Page. I love how calligraphy looks, and even though I don’t have any calligraphy pens to write with yet, I make do with my stabilo ones. 2. 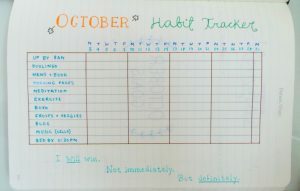 Right after the title is my Habit Tracker: Here, I mainly track my routines and healthy reminders during the day. My morning routine consists of getting up early, practicing Italian on Duolingo, reading the news and a book(s), writing my morning pages, meditating, exercising, and planning my day on my bujo. It’s quite lengthy, as I usually read for an hour, but it definitely feels very rewarding. 3. 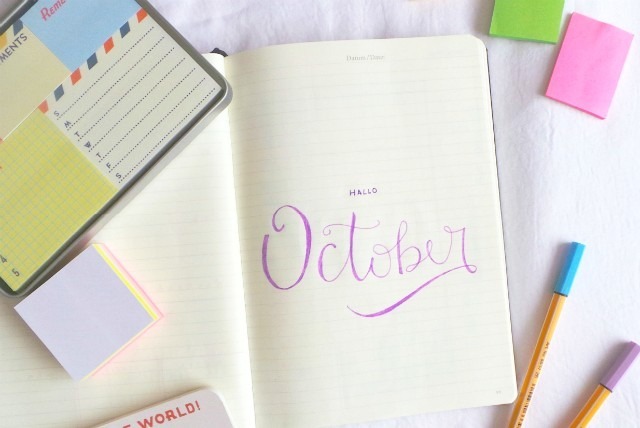 For October Goals, I highlight briefly what I aim to achieve this month for each of the 6 areas that I’m working on: Fitness & Health, Education, Language & Literature (anything writing and books related), Music, Work, and Creativity. For Memories, I fill these in at the end of the month, to remember and record down ‘special’ moments that I want to keep on my journal. 4. Next, I have an Overview for my daily tasks and events. I don’t really use this page that much anymore, but it can be useful for jotting down any events ahead of time. 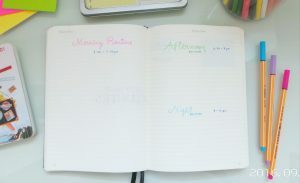 I normally use this to track my classes, events, and outings. On the right-hand side, I like to write down films and books that I would like to read, as a reminder. 5. 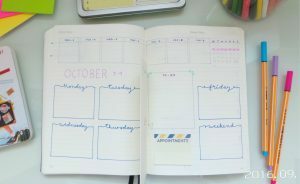 This is an extra spread that I added this month, and it’s my Blogging Schedule. 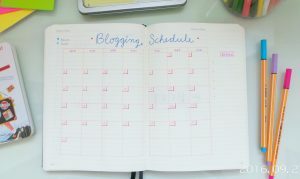 I have lately started to pre-plan and pre-write my blog posts, as I used to write and publish them all on the same day, which didn’t give me enough time to proofread them. 6. I usually read a few books a month, if I’m lucky, and I always like to highlight any quotes that I want to remember. 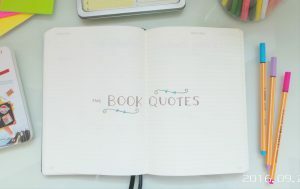 I thought it would be a good idea to put some of them on pen and paper on this Book Quotes spread. 7. I have to be honest – this Routines spread was a bit unnecessary. I’m a huge fan of routines, as it can reduce my decision-making energy for small tasks and focus my energy on the ones that matter the most. But I already have my routine tracked on my phone, which makes it easier for me to keep track of my tasks. Writing them here would be just for show, really. 8. My 1st Weekly Spread (finally)! I decided to go with this design, along with a dutch door (I folded it so you can’t really see it on the image below). On the door, I just keep track of my 6 areas (fitness & health, education, etc.) 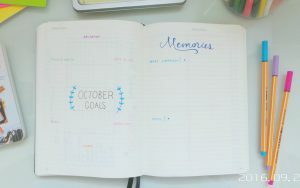 as a weekly ‘goals’ spread. I’m not a huge fan of the dutch door, but I like how it adds that ‘extra’ thing to my spread. 9. My 2nd Weekly Spread is one I have seen quite a lot on the internet. Obviously, I adjusted it so I could fit my design into it. This design is very apt for those who like a simple and spacious spread. Here’s the second page of the same spread. On the right hand side, I found a lovely design of this quote on Pinterest, and basically copied it (unfortunately, I don’t have any imagination). 10. My 3rd Weekly Spread is also a very popular one among bullet journalers. I really like how you can see everything all in one page, just like my 1st Weekly Spread, but also having room to write down other things. 11. My 4th Weekly Spread is one that I have not used before. I saw this on a YouTube video, and quite liked its simplicity. 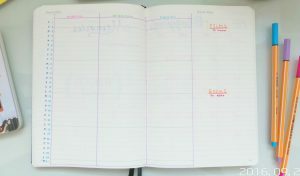 It basically gives you enough space to write all your events and daily tasks on the same place (unlike other places, where they were written separately). 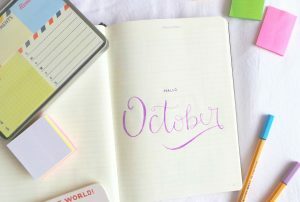 I really hoped you liked reading/seeing my October bullet journal setup. If you also share your bullet journaling designs, please share them with me!